There are three other pages detailing the sculptures and their creators Sculpture 2, Sculpture 3 and Sculpture 4 . 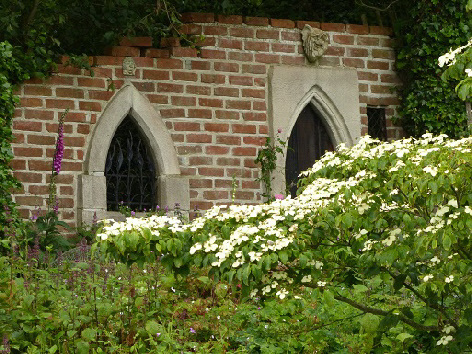 Nigel built the folly above using old Jersey bricks and the Gothic window and door arch from Redwoodstone . The grotesque above the door is called “Shy George”. 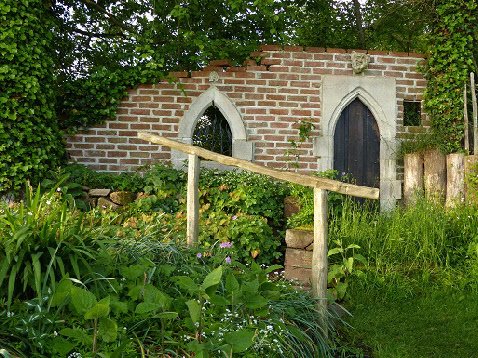 The inspiration for this part of the garden came from a reference to an ancient priory, which no longer exists, in our valley. 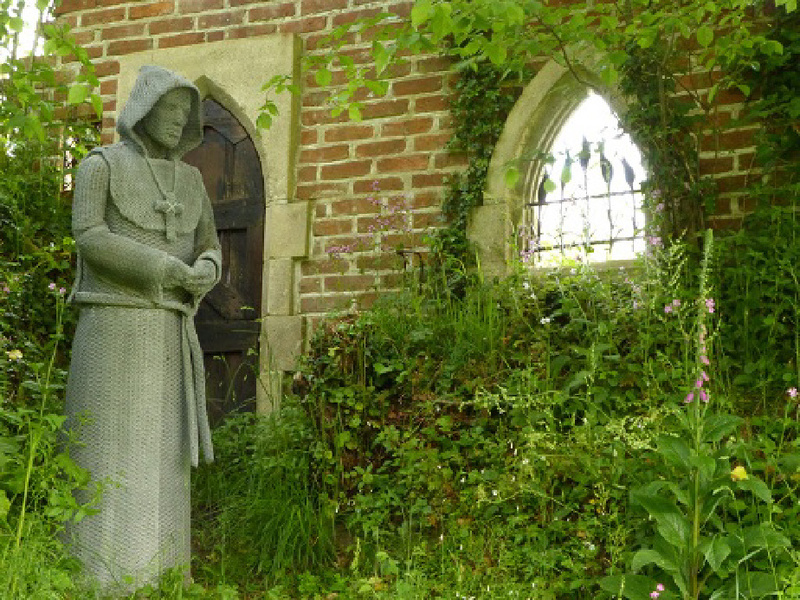 To complete the ‘priory’ we commissioned a wire monk from Derek Kinzett. At the beginning of 2005 we decided to re-new the slates on the front of the house and to incorporate two wire sculptures - a cockerel and hen - that we commissioned from artist Rupert Till. 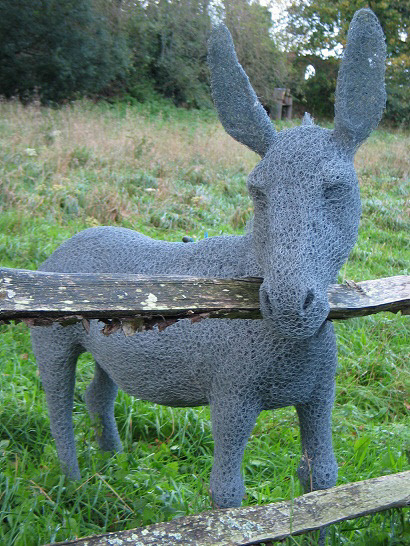 As you make your way down the lane to our home, you will be greeted by our friendly donkey, beautifully made by the very talented Helen Godfrey . 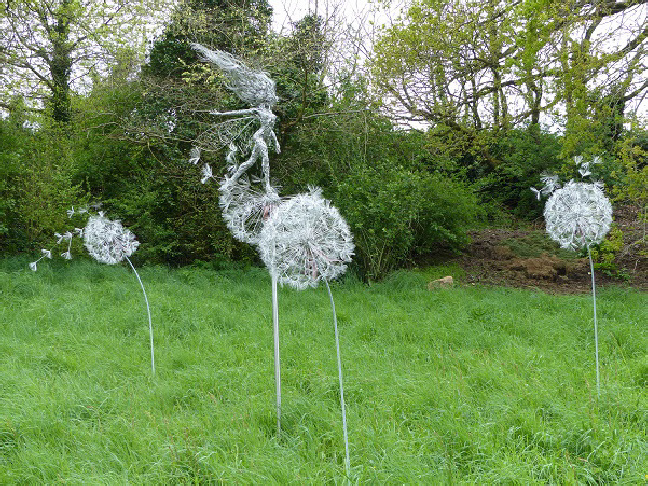 New for 2017, behind our donkey are these brilliant stainless steel dandelions made by Amy of Fantasy Wire Limited and ‘Breeze’ made by her father Robin Wright - follow this link to ‘Breeze - the video’. We saw these walnuts and knew we had just the right place for them. They come from the Thorverton Stone who have a wide range of other fascinating handmade designs. 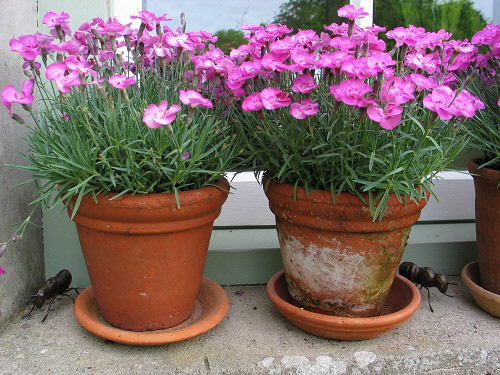 Even small pieces, like these ants,on the window sill, add interest for visitors. 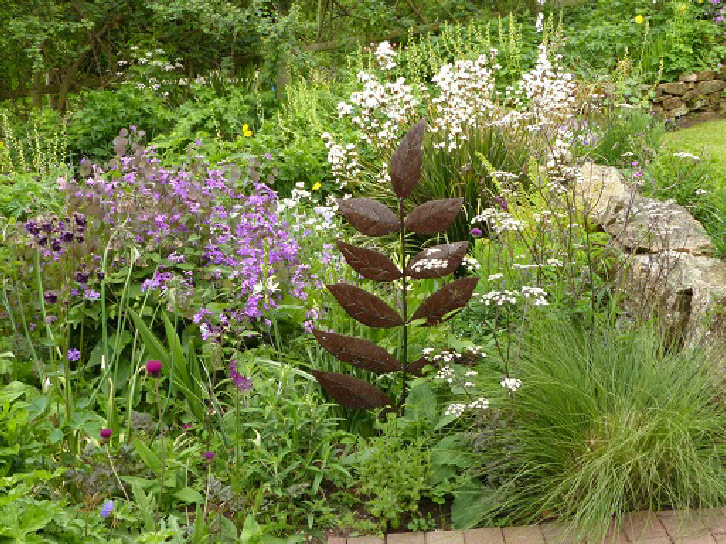 Leaf Form III was created by Peter Clarke and fits perfectly in the garden. 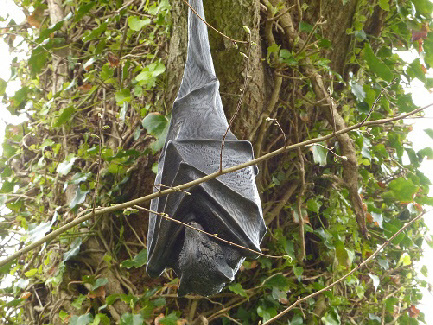 Close to the folly, we have installed a fruit bat sculpture by Teresa Martin. In the meadow, in front of the folly, are two bee skeps made from straw, sitting in a wooden ‘bee bole’ made by Nigel. We are fascinated by skeps and hives, although we do not keep bees ourselves, a swarm did once take up residence in one of our hives. 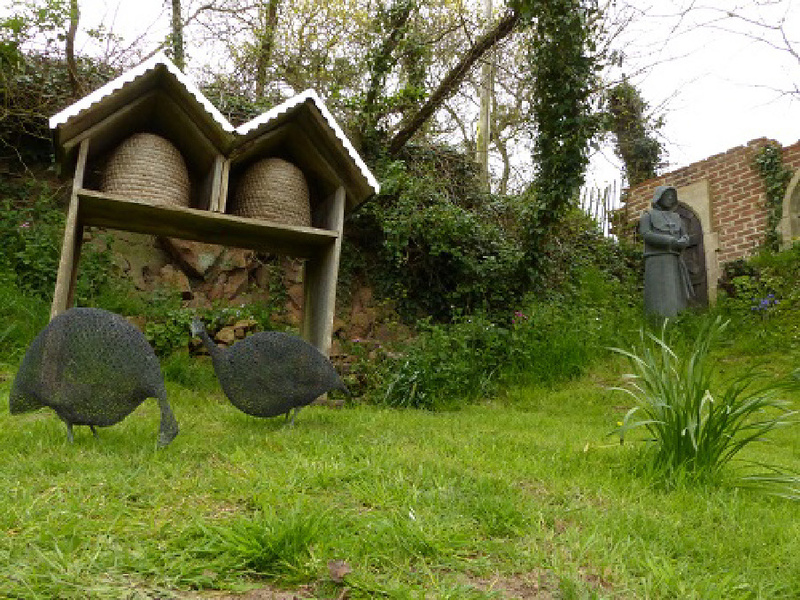 In front of the bee bole, are two wire guinea fowl, made by Helen Godfrey. 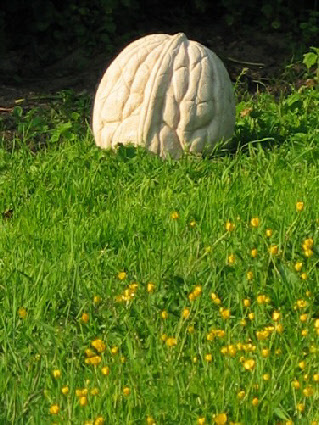 Having sculpture around the garden is very important to us, and we are always adding to our collection.